I found honeydew melons and kiwis on sale this week at the grocery store and picked them up. We had some fresh and I decided to make some juice with the fresh fruit. Am glad I made it. A great drink to refresh you on a hot summer day! Peel the melon and kiwi and scoop out the seeds from the melon. Chop them roughly. In a blender, add the fruits, sugar and a few icecubes and pulse to get a smooth juice. I made this with the fruits I had, you could use any fruit of your choice. Fill a huge glass with the juice and enjoy a hot summer day! Sending this to AFAM:Melons hosted by Ashwini, originally started by Maheshwari. This is a basic sponge cake which I baked for my hubby's birthday. I added a little pineapple essence for more flavor. I am not very good in frosting. I made a simple cream cheese frosting. We liked the cake very much and here is the simple recipe. Beat the egg-whites for about 10 minutes until very light and fluffy. In a nother bowl whisk the egg yolks and add the sugar, salt, and pineapple essence. Beat in butter and boiling milk. Sift together flour and baking powder and add the liquid mixture in very quickly. Pour the batter in a greased cake pan. Bake at 350 degrees for 25-30 minutes or until a skewer inserted comes out clean. Cool completely in a wire rack before frosting. I made a simple cream cheese frosting by mixing the cream cheese, sugar and color together. It tasted great with the mild pineapple flavor and cream cheese. This is a recipe passed on to me by my grandma soon after my wedding. She handed me a notebook full of her authentic recipes in her own handwriting which I treasure. My grandma is a great cook and whenever we used to visit her place during our summer vacations we used to return only after gaining a few pounds after eating all her delicious cooking. This is one of her authentic creations. 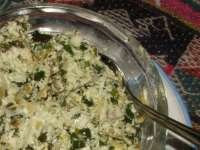 It can be made by soaking and grinding the rice and pulses. But this is an alternative quicker version using gram flour and rice flour. Chop the onions finely. Sift the rice flour, gram flour and maida together. Mix all the ingredients together. Add water and make a thick batter without any lumps. You can add a little more chilli powder if you want it extra spicy! In a heavy bottomed vessel, add oil to about 2 inches high and heat. When it is piping hot, ladle a small amount of batter with a spoon and drop the in the oil carefully. Deep fry them in batches of 5 or 6 till they turn golden brown in about 2 to 3 minutes. Take care the flame is not too high, otherwise the inside might not get cooked properly. Sending this to My Legume Love Affair - 11th helping hosted by Lori and started by Susan. This is a very flavorful and easy rice recipe which is variation from the normal vegetable pulaos, vegetable biryani, mutton or chicken biryani. It is flavorful since it is blended with spices and healthy and packed with protein because of the addition of chickpeas. Soak the channa/ chickpeas overnight. You can use canned chickpeas instead. Wash and soak the rice for about 30 minutes. Grind the masala ingredients into a smooth paste. In a pressure cooker/pan , heat the ghee/oil. Fry the cashews and raisins. Once they turn golden brown, remove them aside. In the same ghee/oil, add cloves, cinnamon and cardamom. Fry until it gives a nice aroma. Add the washed and soaked rice and fry for a while. Add the water and salt. Keep closed and cook until the rice is done. Heat some oil/ghee and saute the chopped onion until translucent. Add the ground masala and cook till raw flavour disappears. Add the diced tomato and saute for a while. Add salt to taste. Now add the channa and simmer for a few minutes so that it blends with the spices. Finally add the cooked rice and mix gently. Garnish with fried cashews , raisins and coriander leaves.. 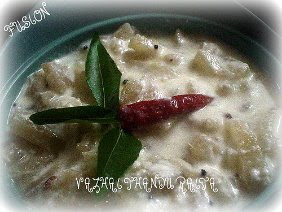 Serve with a simple raita or kurma of your choice. Sending this rice recipe to Monthly Mingle-Ravishing Rice hosted by Nags and started by Meeta. I am here with the roundup of Bookmarked Recipes #54. A big thanks to all my fellow bloggers for sending in their valuable entries. Renuka recreates this healthy Vazhaithandu Raitha from Potlucks Special book. 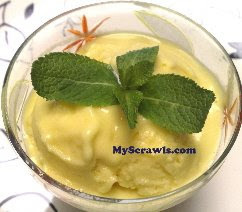 Ramya has sent in a Khandvi recipe adopted from Kenstar Microwave Cook Book. 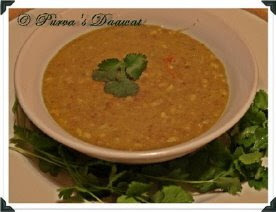 Purva Desai has sent in a comforting Hariyali Masala Dal a recipe originally from a newspaper. 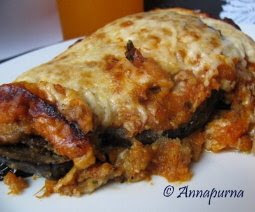 Srilakshmi makes this tempting Eggplant Parmesan from Gina's blog. Happy Cook makes this appetizing Chicken Curry from Ranji's Kitchen Corner. Poornima bakes delicious Chocolate Chip Muffins adapting the recipe from Bake or Break Recipes. James makes these pretty Brandy Snaps adapting the Merrilees Parker's recipe. 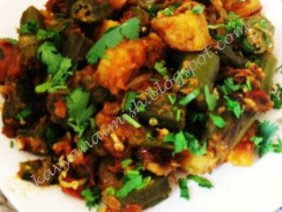 Kavya Naimish makes this delicious Aloo Bhindi a recipe originally from Sailus Food. Next week’s round up will be hosted by Joelen from Joelen's Culinary Adventures. This is the first time I tried making sweet potato fries and we were totally in love with it. I adopted the recipe from here. These are good since they are baked and have a natural sweetness and a little spiciness. You can add any herbs and spices according to your liking. They serve as a great appetizer and also a good snack to munch on! Peel the sweet potatoes and chop them into long strips of about 3 inches long and about 3/4 inches thick. They tend to shrink while baking. So make sure they are thick. In a bowl, combine together the spices and olive oil and toss in the chopped sweet potato fries until they are well coated. Spread the sweet potatoes on a greased baking sheet in a single layer. Bake for about 30 to 40 minutes turning them twice in between. 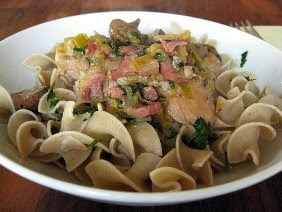 This is my entry to Bookmarked Recipes being hosted in my blog. Hurry and send in your recipes before Sunday May 17th! Being food bloggers, I am sure everyone bookmarks tons of recipes to try out. I do the same too. I bookmark all my favorite recipes. But I hardly try them. So let us take this opportunity to lay our hands on those bookmarked ones and try out your favorite! 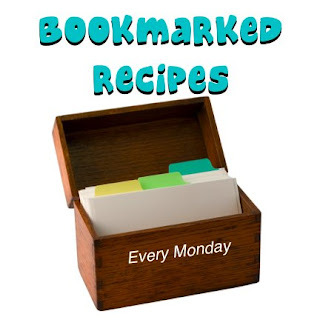 Bookmarked Recipes was started by Ruth and I am hosting it here this week. This event is only for a week. See you all in the roundup on Monday!! Send in your bookmarked recipes before May 17th!! Upma is a common breakfast in South Indian cuisine especially during busy mornings. This Upma is made with oats and I tried this as a variation to the normal rava and vermicelli upma. 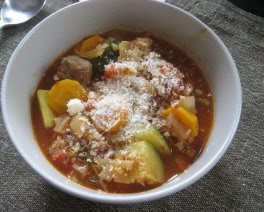 It is a healthier option since it includes oats and a load of vegetables. It is mildly blended with spices and makes a one pot meal. Chop the onions and vegetables. I used a mixture of carrots, corn and peas. Mice the ginger. To a kadai, add the oil and do the seasoning with the mustard seeds, urad dhal, channa dhal, curry leaves. Then add the onion and saute till translucent. Add the ginger and slit green chillies and fry for a few seconds. Add the mixed vegetables and saute for about 2 to 3 minutes. Add the water and bring it to a boil. Add the sambar powder and oats and stir well. Also add salt to taste. Cover and cook for about for about 10 minutes until the oats is cooked through and absorbs all the water. it should not turn very mushy. it tastes best if it still remains chewy. Serve hot with yoghurt and pickle! First let me thank all my friends for helping me reach this milestone of 200 posts. This could not have happened if not for all the readers and friends who read my posts regularly and encourage me through your lovely comments! 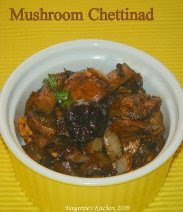 Coming to the recipe, I adopted this recipe from Revathi Shanmugam's cookbook 'Veetileye Seiyunga Variety Fastfood'. Amma got this cookbook for me after my wedding. It consists of very easy recipes which even a kid could do. This is a simple recipe with bread. It takes not more than 5 minutes to prepare this. I made this one evening when both of us returned home hungry craving for some snack. I had nothing but bread at home. Lazy to switch on the laptop and search for some quick recipes, I took out this cookbook which had been lying around untouched..This recipe has very basic ingredients which are available in almost every Indian kitchen..
Toast the bread slices with some butter. Chop the onions and coriander leaves finely. Add the onions to the curd along with salt to taste. Now comes the assembling part. Over each bread slice, add about 2 to 3 spoons of the curd mixture. Add about 2 to 3 pinches of the cumin and chilli powder. Garnish with coriander leaves. This should be prepared when you are ready to eat them. It gets soggy soon. You can play around with ingredients of your choice. Some variations: ketchup, grated carrot,sev etc. Finger-millet or ragi is widely grown in arid areas of Asia and Africa. Finger millet can be ground and cooked into cakes, puddings or porridge. It is a storehouse of protein, calcium and fiber. Ragi flour is made into flatbreads, including thick, leavened dosa and thinner, unleavened roti. Ragi grain is malted and the grains are ground. This ground flour is consumed mixed with milk, boiled water or yoghurt. Inspired by her and her, I tried a different recipe of Ragi Malt. I used jaggery instead of sugar. This drink can be had as an alternative to coffee and tea and also for breakfast. It keeps you full and is nutritious too. This jaggery flavored nutritious ragi malt can be had either hot or cold. To the ragi flour, add little cold water and mix to form a smooth paste without any lumps. In a vessel, bring the milk and water to boil. Add the ragi paste slowly to the boiling milk. Keep stirring with a spoon in order to prevent lump formation. Add the jaggery powder and cardamom powder. Cook on low flame for about two minutes. The mixture thickens. Remove fro heat and serve hot or cold! Jaggery can also be replaced with sugar. It can also be prepared with milk alone instead of adding water to get a thick drink. Also check out a similar Ragi recipes. Sending this ragi malt to 15 minute cooking hosted by Mahimaa and to Gramathu Kaimanam hosted by Shama.